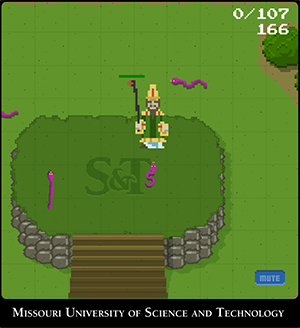 A screenshot of St. Pat's Snake Invasion, recipient of a CASE Gold Award. Click here to play. Image courtesy of Missouri S&T News & Events. Missouri University of Science and Technology received 11 awards for excellence in graphic design, news writing, video production, digital publications, research publications, community relations projects and photography from the Council for the Advancement and Support of Education (CASE) during the CASE District VI conference held Jan. 24-26 in Kansas City, Missouri. S&T won four gold awards, two silver awards and five bronze awards in the annual competition. CASE received over 400 entries for the annual awards program from colleges, universities and independent schools in Missouri, Colorado, Iowa, Kansas, Nebraska, North Dakota, South Dakota and Wyoming. CASE is the international organization for educational advancement. Its membership is made up of college, university and independent school staff members in the areas of alumni relations, communications and marketing, and philanthropy.